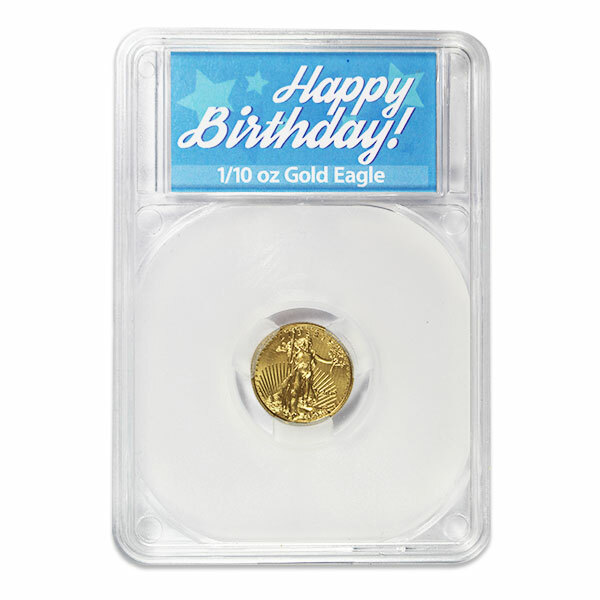 The Gold American Eagle is recognized everywhere as one of the world's most popular bullion coins - particularly in the affordable tenth ounce size. The striking robed Lady Liberty on the obverse hold the torch of liberty aloft in one hand and the olive branch of victory in the other. Bald Eagles adorn the reverse - protecting their young in a nest. It is a stunning and iconic design, generally considered to be among the most beautiful of United States coins. Each coin carries a legal tender value of $5 U.S. dollars. Additionally, coins are marked with the gold content - 1/10 oz fine gold. Every coin's weight and purity is assured by the US Mint. 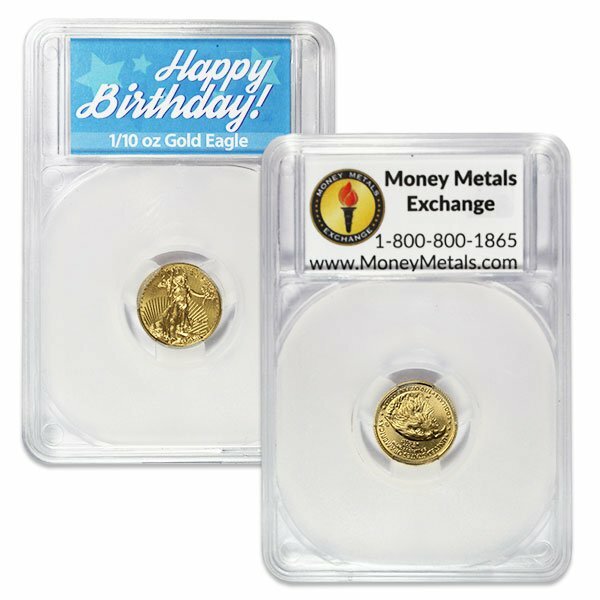 The 1/10 ounce is the smallest size among the fractional Gold Eagles minted. Investors choose this dime-sized coin to diversify their gold holding. Many believe smaller coins like thse will command a significant premium should gold prices move much higher. The day may come when larger 1 oz gold coins are simply unaffordable for many people, raising demand for fractional sizes. The size is also popular among preparedness-minded stackers who want coins suitable for barter, if needed. One ounce coins for sale may be impractical for use in smaller transactions where they would require the counter-party to make lots of change. Buyers can be confident that any 1/10th oz Golden Eagle purchased today will be in high demand whenever the time comes to sell. Dealer bid prices for these coins are generally the highest among all fractional sized bullion coins because they always sell quickly. This coin will make a fine and memorable gift. It is attractively packaged in a clear plastic case and labeled "Happy Birthday!" Lady Liberty (obverse) - The Striding Liberty artwork was first created by Augustus Saint Gaudens for the 1907-1933 gold double eagle coin that can be purchased on Money Metals. It features the image of Lady Liberty walking forward with the sun's rays behind her as she carries a torch in her right hand and an olive branch in her right. Bald Eagle (reverse) - The reverse side of these 1/10 oz US gold coins feature a male bald eagle returning to his nest with an olive branch while his family awaits his arrival below. The image of the Golden Eagles signifying the strength and security of American families. It's a great choice for investors looking to buy gold bullion due to its small size and weight. 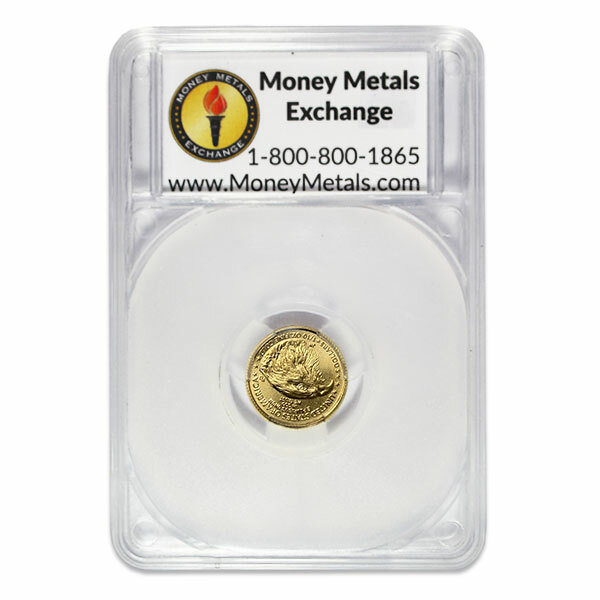 If you have any questions about the Golden Eagle or other gold coins to buy online or over the phone, you should call Money Metals Exchange directly at 1-800-800-1865 to inquire about the current American Gold Eagle price and product availability and/or to place an order.